It’s like a GPS and machete to help you burst through the jungle of what’s holding you back from complete sales mastery! It’s time for that someone be you. when the customer is ready to buy, so selling becomes easy, comfortable, and fun. Selling is a complex subject, yet it follows a simple process. The little secret is that people don’t like to be sold, but they really love to buy! Salespeople often use one of two approaches— both are flawed. It’s a flexible sales process that puts you in control and gets others to do all the heavy lifting for you. And, the best thing is that you have a pocket coach and a step-by-step road map that allows you to spot and fix typical sales weak spots before they can do damage to your sales numbers! How is that possible? They have the right system and the right approach. They spend their time in three distinct areas, understanding that these key areas hold the keys to turbo-charged sales. In short, they know a secret that the other 99% of sales professionals don’t. I’ve been in your shoes – out in the trenches day-to-day. I also have been a top 1% sales producer. Whether you’re a new salesperson working to get that first client or you’ve been selling for years, the systematic process is always the same. Debbie’s wisdom is for anyone who has ever thought, ‘sales is so hard.’ If you want a systematic, simple way to make more sales and enjoy yourself in the process, then you need to get this book today! 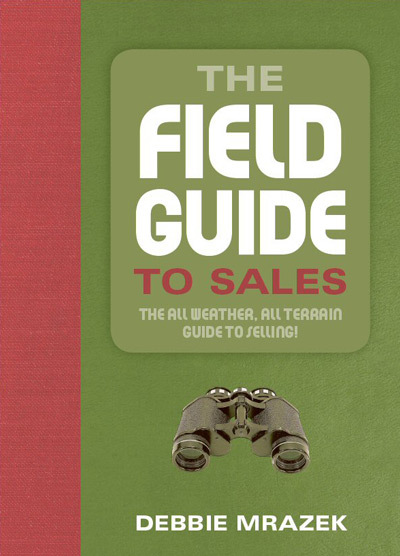 Order The Field Guide to Sales book by itself. The Field Guide to Sales is $24.95 plus U.S. shipping, or $29.95 plus international shipping. The companion e-modules are $27 each. The entire 12-chapter eManual is $147. That’s less than half price of the total of 12 individual e-modules. This is the only way to have one-on-one interaction with Debbie, short of contracting with her for sales training or consulting. Total bundle price is just $197. Bought separately: $349. That’s a 43% discount, and you get time with Debbie.